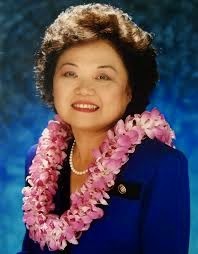 Patsy Mink was born and raised in Hawaii, the island of Maui. Her grandfather emigrated from Japan, making her the sansei generation (first generaton is nisei.) In Hawaii, maybe even more than the 'Mainland,' your status due to race and ethnicity is very upfront. But that hindered Patsy Mink not at all. As a teen in Maui, she was student body president--the first girl, an Asian American, winning just after the attack on Pearl Harbor. She learned how to build coalitions then, and continued for decades in Hawaii and the U.S. Congress. She boldly stood for equally for all, no matter of race, ethnicity, or gender. She was amazing. Maybe her years at the girls' school in Maui, Maunaolu Seminary, was the confidence-creator. Her family hugely believed in her, too. Her political career contributed much to education and civil rights. Check out her story, how much can a girl accomplish! 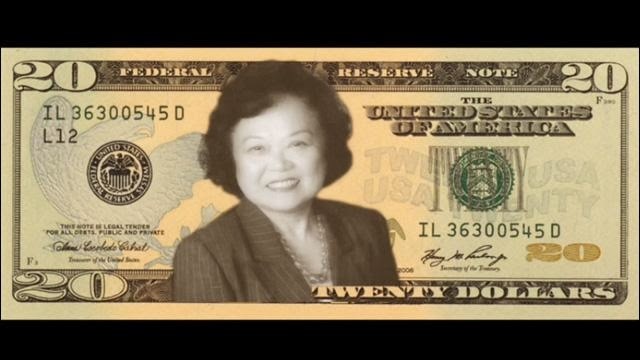 Maybe vote for Patsy to be on the $20 bill instead of Jackson.